Are you managing other people? If so, you probably know firsthand that traditional project management is broken. To really manage a team, you need a new kind of tool—one that’s built to manage people, not projects. 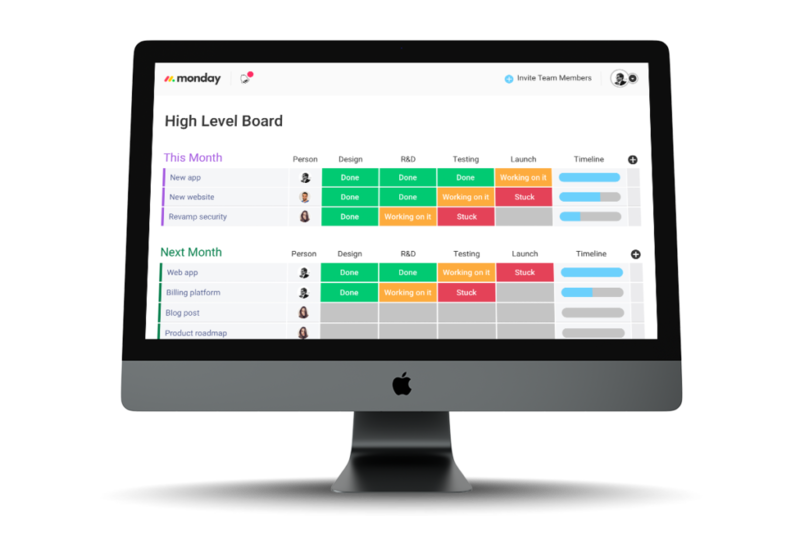 We built monday.com out of our own frustrating experience as managers. We were suffering from emails, meetings, and random check-ins to try to figure out what was going on, and no one ever felt on top of things. The tools we were using didn’t help. At best, they just listed the work we needed to do; they didn’t create the sense of control and clarity that we desperately needed. So we spoke with hundreds of managers and learned how they approach their top management challenges. We discovered three basics that help the best managers around the world lead happier, more productive, and more successful teams. These are the principles upon which we built monday.com, and as of this moment, we have 15,111 teams who are working smarter and achieving more with monday.com. When you manage without goals, you just hand out on task after another. You want to avoid that, because it will cause your team’s motivation to decay. Think about climbing a mountain as a team, but instead of seeing the peak, the managers simply tell everyone where to step next. The team loses orientation. They don’t know how far they have to go, and most importantly, they lose motivation when the climb gets particularly steep. They climb more slowly or give up completely. People feel that their work is an endless, pointless, and exhausting endeavor, simply because they don’t see the big picture. For us, the solution is to build a culture of transparency, and it’s inherent to our product. The monday.com board shows everyone exactly how the tasks fit into the greater context of the process, who is responsible for what, and where things stand. Even the tallest mountain feels like something you can conquer together when it’s all visually laid out in a board. We lose our sense of control without proper time management. A detailed project hierarchy never helps with planning, because it leaves the order of execution out. Actual work is always planned by dates and deadlines, so it makes no sense to start with a list of detailed tasks. Instead, you should plan a detailed list of all the tasks you’ll complete this week, next week, and so forth. Managing by time creates an achievable goal, a sense of urgency, and forces the team to make smart decisions. We have a great post on exactly how to build a weekly task board for your team; see: 3 Ridiculously Simple Steps to Skyrocket Your Team’s Productivity. 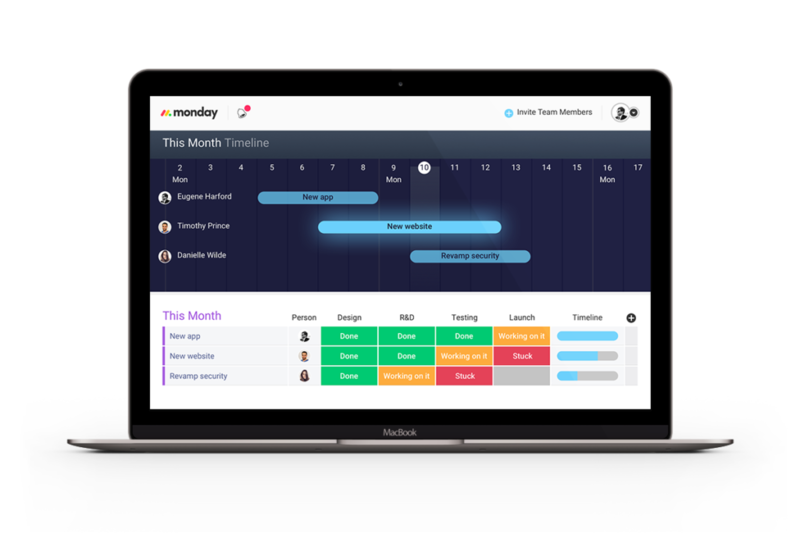 And last winter, we made time management even easier with the release of our timeline feature, which is similar to a Gantt chart except it’s simple, intuitive, and totally focused on people. Have you heard Dan Ariely’s great TED talk on the science of what motivates people? One of the top factors is receiving recognition for your work. monday.com takes people’s need for recognition to a whole new level. Everyone sees a list of weekly tasks, and when a task is marked as “done,” it turns green. Everyone knows, and recognition is given from the whole team, not just the manager. It’s instant and powerful. As a team, you can focus on the shared goal of turning the whole week green, and give each other recognition and celebrate together. That’s why people say that monday.com is addictive and also makes teams happier.